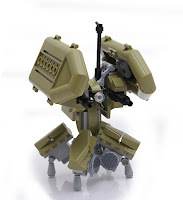 I have a couple of set 30251 Winzars' Pack Patrol so I figured I'd do a review. This set was available at Target for $3.99. It has 38 pieces. Here's the bag it all comes in. These are the parts you get with the set. As you can see there are a fair amount of clips that will come in handy in building mecha. The "bladed tonfa" pieces are always fun. 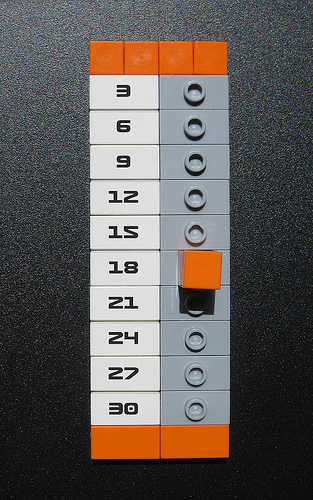 The minifig skis can be used in interesting ways. I haven't had a chance to use the stubby bracket yet, and cheese slopes are always handy. The giant bone might be tough to incorporate into a build though. 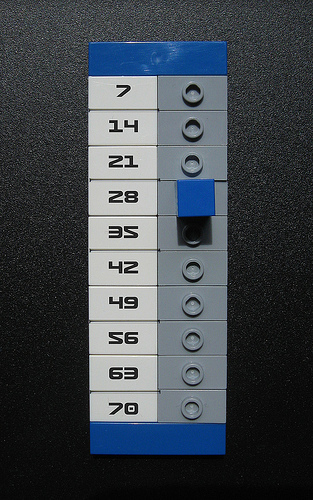 This is the minifig and instructions for the set. I think the mask/helmet/headpiece could make an interesting face for a mecha. At a ratio of roughly $0.11 per piece, this set is a little outside my purchasing comfort zone. I'm going to give it an A-. One of the things I've been mulling over since PAX East 2013 is a scenario that would lend itself to a quick demo of Mobile Frame Zero. Thanks to a recent airplane trip I may have a scenario, just not the one I need. Official Lego minifig scale airplanes tend to be a little on the large side. 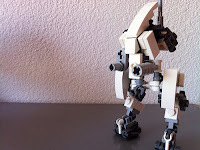 They are also mainly constructed from large pieces that do not interact well with the damage rules. Let's just use this one as an example. Now, imagine that problem with the damage rules was eliminated by making the plane into a station. Yup, you heard right, the plane is now something that no longer takes damage and something the players will fight over. You combine that with something like Mechatonic's Spaceport Battle and you just might have something that people will talk about for a while. Personally, I'd love to have this beast in the middle of the table. Of course if I'd bought the Indiana Jones Flying Wing while it was in stores, that would be awesome too. The other alteration to the rules is that each player now only has one station. Points Per are figured out as usual. Placement is a little different in that no-one can control the plane (station) in the center of the table but otherwise it still follows the same procedure. It also might be worth extra points for future scenarios or for the campaign -- if you're doing that sort of thing. The only problem I can think of at the moment is making sure you have a big enough table. 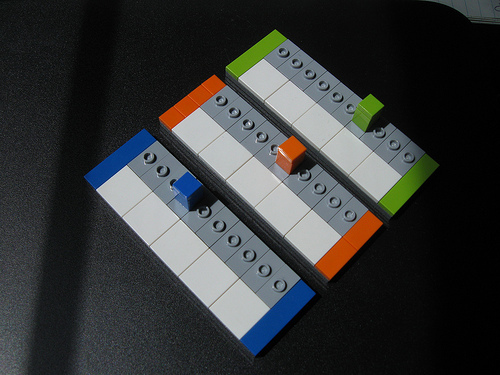 In this post, I mentioned my like of building microscale vehicles. Now it occurs to me that I haven't really shown you any pictures of said vehicles here on the blog. Well, maybe a link or two but does that really count? A pair of '50s style jet cars. This is an awful picture I really have to re-take. An attempt at a sci-fi version of a McLaren F-1. Like the original wasn't sci-fi enough. Something a little more normal looking. This is meant to be a 20' tanker truck. These are my absolute favorite builds when it comes to vehicles. It's a shame they're out of scale with everything else I've constructed. Another picture I need to re-take. There's a few of mine. Have you built any microscale vehicles lately? I was going to do a post about a scenario idea I had but that can wait a bit. 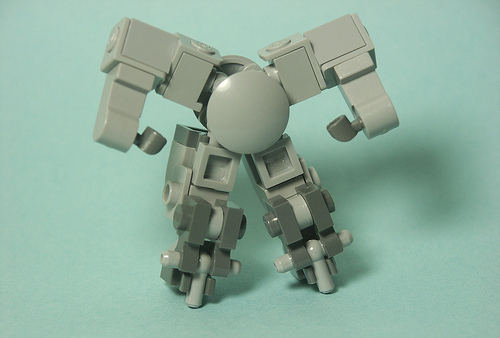 Frame kits are something that gets talked about on a regular basis by the MFZ community. There's a whole discussion topic over on the Hangar. Over on the French MF0 Facebook page, Antoine Davrou is putting together Starter Packs for 65 Euro. You might know him as Ybliss on Flickr. Here's what hes got so far. Each kit comes with the parts for the frames, dice, and a ruler. I think this is the first time anyone has done something like this. 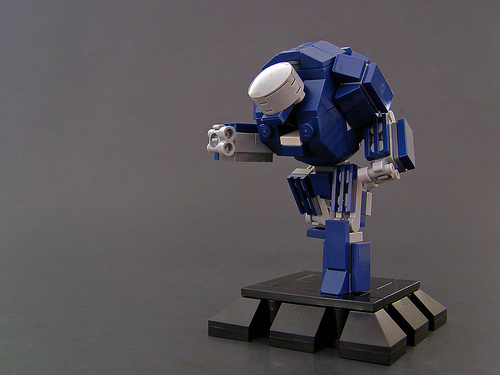 Yes, I know, there's the Garage Kit and someone used to make Classic mecha kits for Mechaton. But I think this is the first time someone has included dice and a ruler to make these kits playable from the word go. Yes, I know, it's a horrible pun. I've built a number of things recently that will make really neat stations. I'm calling this an "Experimental Windmill". I don't have a name for this yet, but it is a copy of a previous tablescrap. 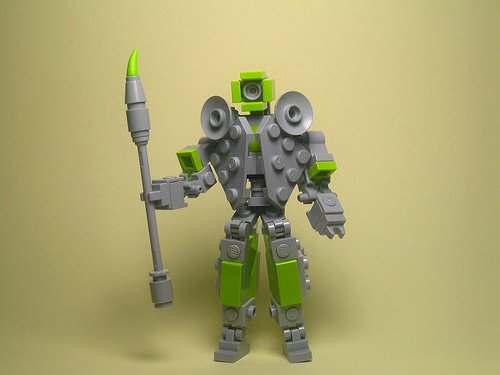 TCC has a few mechs in his Flickr stream that could be useful for MFZ play. The first two are part of a series using Lime Green as an accent color. Not the one MFZ fans know. This is the one I find most interesting. With a few tweaks I think it could be a really neat frame. Goodness Knows What Fruit Is This Color. I think I like this one more than the one before it. Great use of color. Here are a few new -- to me -- websites in the MFZ community. Hungarian MFZ Facebook page. -- What it says on the tin. ipernity MFZ Group. -- Yeah, I'm flogging this again. MFZERO Flickr group. -- This Flickr group is dedicated to MFZ creations "in the brick". Originally this was going to be another "Non-Human" post. I came across three humanoid ones that were too good not to include though. "Elk" Riot Supression Biped by NickD. He doesn't allow downloads. 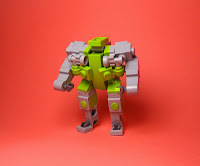 Tigard Drone by Lego Junkie. Judging from those rafts, this may be a little big for MFZ. Looks like it should be the right size for MFZ. Looks neat but very fiddly. Might not stand up to regular gameplay. Here are the three humanoid designs. 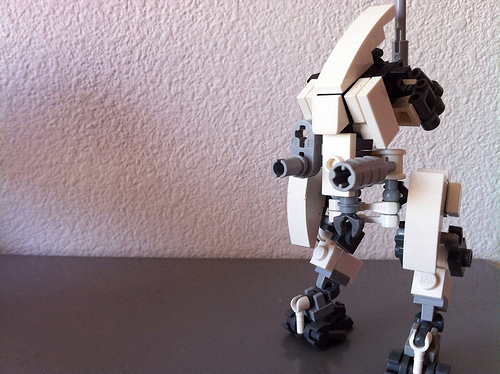 w.05 Infantry Grunt v2 by messymaru. 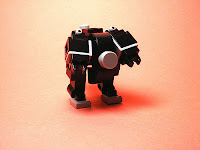 One of the benefits of writing your own Lego blog is being able to feature your own creations. It's not like someone is going to stop me. :-) This time I'm going to feature my pictures and groups on ipernity. 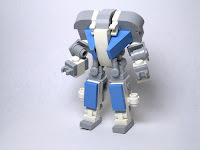 I've started a MFZ group. I have an album for my ubiquitous Crab Mecha. 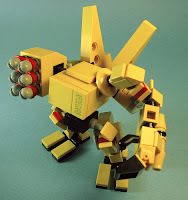 Another one for Block Chest Mecha. A Brickblend album. A vehicle album. 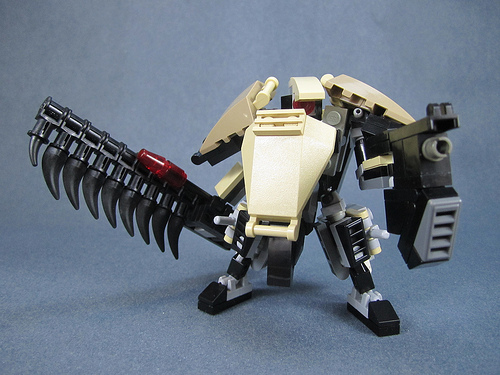 A non-human mecha album. Oh, I passed 100,000 views sometime Tuesday night. Thanks all! These were posted recently by Ybliss. They're a method of keeping track of your initiative score/victory points. show how he uses numbered tiles, which I believe are stickers of his own design, to represent the scores of each company. Simple, straightforward, excellent. I'll be on vacation for most of next week so there won't be any blog posts. Don't worry, I've got some good stuff saved up and I'll try and overload you this week. Apparently there is a Mobile Frame Zero France Facebook group. We'll be opening registration for the Hangar on Wednesday (6-5-13) from 7am to 5pm EST. If you register, please contact myself or Dukayn in some manner so that we can make sure your account is activated. 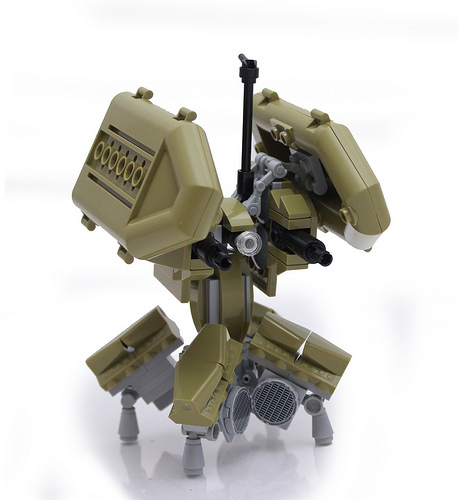 As I mentioned here there have been other attempts at Bricklink competitors. 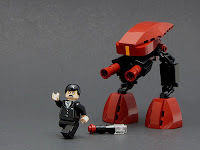 Another one was brought to my attention by Brickset. Bricktrader is currently up and running. 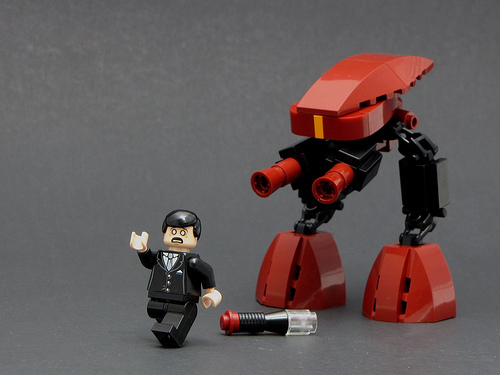 There is a simple difference between Bricklink and Bricktrader though. The latter is more like eBay than the bazaar that is Bricklink.